An original crochet amigurumi koala pattern by June Gilbank. 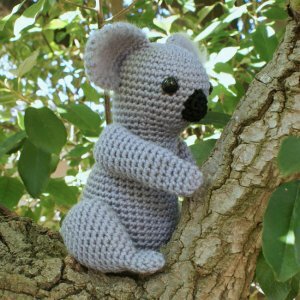 Details: Pattern includes full instructions to make an adorably realistic crocheted koala with true-to-life shaping and poseable arms. Detailed instructions and 23 step-by-step assembly photos ensure that your koala will turn out absolutely perfectly too! Optional: If you'd like to make the fluffy ears as pictured, you'll need a wire pet slicker brush to brush out the pieces after crocheting (instructions are given in pattern). Suggestion: Although I didn't do this with my koala, if yours will be a toy for a child you could add some velcro or a press stud to his hands so they can grasp together and he can cling onto things - extra cute! Date Added: 10/06/2016 by Holly M.
Date Added: 05/17/2012 by Chrisie M.
Date Added: 04/12/2012 by Sandra G.